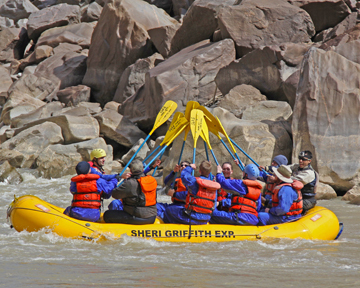 April Discounts on our Family Rafting trips on the Green River! FAMILIES: Limited Time Special Newsletter Offer! Where could you do so much for less than $150 per person per day? 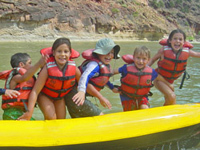 Each day on the river you will enjoy: camping on big sandy beaches under towering cottonwood trees, having all the meals prepared for you, team paddling on the paddleboat, inflatable kayaking alone or with another family member, hiking to outlaw hideouts and ancient Anasazi petroglyph panels, falling asleep under the stars and enjoying quality time with your family. Appropriate for first time campers as young as 5. 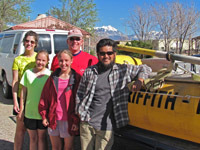 Guides specially selected for their "Kid Skills." Structured activities for kids in camp = time alone for mom and dad. Easy to moderate nature walks and hikes. Great camping locations, most with sandy beaches for play time. Fun education about history,nature and the environment. Includes a Scenic flight over the canyons and the Green River. Newsletter Specials apply only to regular rates and are not valid with any other specials.These discounts apply only to NEW reservations made between April 8 and April 30. These are standby rates and restrictions may apply. 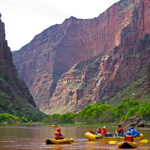 The fisher towers section is a beautiful stretch of the Colorado River , with moderate class I-II rapids suitable for everyone. Boat options include oarboats, inflatable kayaks, and sometimes paddleboats. 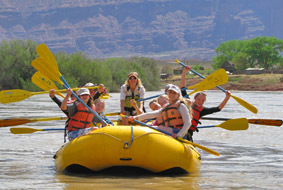 Mild Rapids make this section of the Colorado River especially fun for beginning rafters and perfect for young families. The river is wide and warm, making swimming extremely inviting on those very warm summer days.